The direct vent gas fireplace has a special double-wall pipe that leads from the fireplace to the outside of the house. One pipe pulls in combustion air from outside while the pushes out the fire gases. This type of gas fireplace is often thought to be both the safest and the most efficient, since it uses the outdoor air for combustion instead of indoor air. These have a glass front which cannot be removed except for cleaning. Most of the newer models have electronic ignition therefore no need for a standing pilot light. In a power outage, two D batteries are added for the ignition source. Adding a blower to the fire-box increases its heat output significantly. Click here for various fireplace photos. Having a glass front is not as attractive has a open fireplace, however a direct vent gas fireplace is a great choice for a bedroom since you cannot have an open fireplace due to the carbon monoxide risk while sleeping. 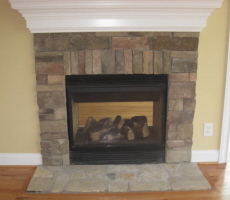 The picture is an example of a double-sided direct vent gas fireplace.